In Thailand, sriracha is frequently used as a dipping sauce, particularly for seafood. In Vietnamese cuisine, sriracha appears as a condiment for phở, fried noodles, a topping for spring rolls (chả giò), and in sauces. In Thai the sauce is most often called sot Siracha and sometimes nam phrik Siracha. Traditional Thai sriracha sauce tends to be tangier in taste, and runnier in texture than non-Thai versions. 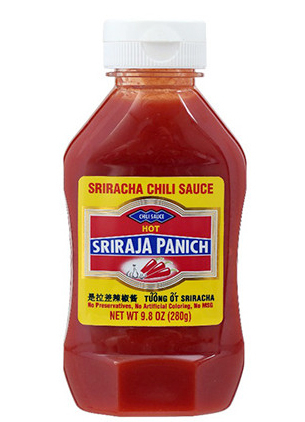 In a Bon Appétit magazine interview, US Asian-foods distributor Eastland Food Corporation asserted that the Thai brand of hot sauce Sriraja Panich, which Eastland distributes, is the original "sriracha sauce" and was created in Si Racha, Thailand, in the 1930s from the recipe of a housewife named Thanom Chakkapak.